Drum roll please …. 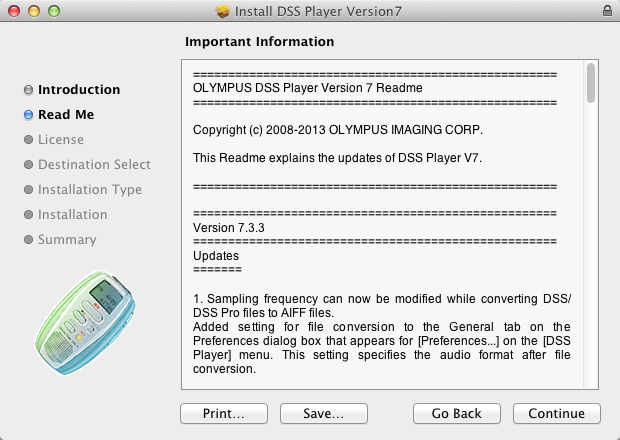 Olympus have just rolled out the latest update to DSS Player Plus v7 for the Mac going to version 7.3.3. The update includes the fix/change/feature to convert audio recorded on their professional digital dictation machines (DS-7000/DS-5000) in DSS Pro (.ds2) format to high quality .AIF which can be used by Nuance’s Dragon Dictate 3’s new transcription feature. And …. take a breath. If you have both Sonority and DSS Player Plus installed on your Mac you MUST remove Sonority before applying this update to DSS Player Plus. Update 7.3.3 is the newest update available for DSS Player for Mac v7 software. The primary improvement in this update is the added support for the transcription feature in Nuance’s Dragon Dictate for Mac 3. When Nuance released Dragon Dictate for Mac 3, one of the new features was the ability to transcribe from a recorded audio file. However, Dragon Dictate for Mac 3 does not support DSS/DS2 file formats and only supports popular formats such as AIFF. Additionally, Dragon Dictate for Mac 3 only supports AIFF files with a minimum sampling frequency of 22.050 kHz. Previous versions of DSS Player for Mac v7 were only able to convert to AIFF at a maximum sampling frequency of 16 kHz. Therefore, AIFF files which were converted in DSS Player for Mac v7 could not be loaded into the transcription feature in Dragon Dictate for Mac 3. With DSS Player for Mac V7.3.3, we have added support for conversion of DSS/DS2 files to an AIFF file that meets the minimum requirements of Dragon Dictate for Mac 3. The format conversion setting can be found within the [DSS Player] menu, within [Preferences]. This particular setting is valid for conversion of DSS/DS2 files only. [Default]: The same as previous versions. The sampling frequency is at the lowest rate, thus the resulting file size is smaller. [PCM 22.050kHz 16bit Mono]: The minimum sampling frequency required for use with Dragon Dictate for Mac 3. [PCM 44.1kHz 16bit Mono]: The sampling frequency recommended by Nuance for speech recognition with Dragon Dictate for Mac 3. The accuracy of the speech recognition is the highest amongst the available options, however the converted file size is largest. 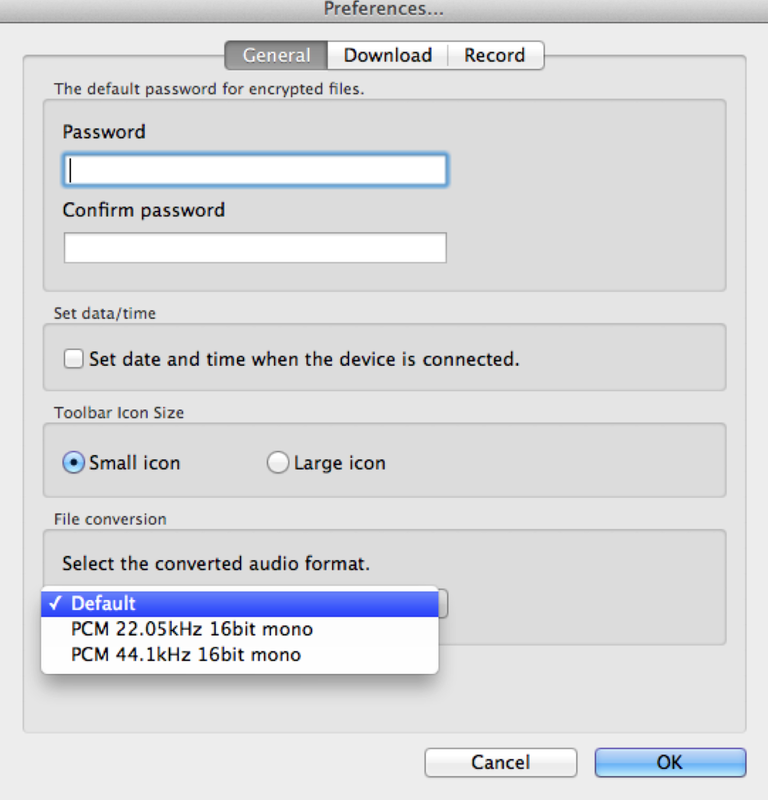 [MP3]: Will be converted to PCM 44.1kHz 16bit Mono regardless of which option is selected in the [Preferences] dialog. This format is compatible with Dragon Dictate for Mac 3.
transcription feature in Dragon Dictate for Mac 3. Nuance’s Dragon Dictate for Mac 3 will only accept files that are under 2 hours in duration. AIFF files which are longer than 2 hours will be rejected. We have been informed that this is the only restriction in Dragon Dictate for Mac 3, however we do not anticipate this should be a problem for professional dictation users. How do I create a user profile on a Macbook Pro with OSX 10.8? The only option I see is for microphones? We are going to use it with the Olympus DS-7000 DVR. No need to create a new profile, just use your usual profile and then select the Transcription option to load in your audio file. Using the Olympus DS-7000 you need to make sure that your DSS Player Plus v7 is on version 7.3.3 – only this version and above converts your recorded .ds2 audio to high quality .aif files compatible with the transcription feature in Dragon Dictate 3 for the Mac. Any problems or more questions please let me know.